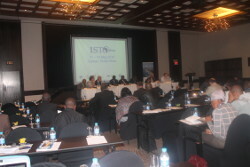 The eleventh edition of the IST-Africa conference series, IST-Africa 2016, was held in Durban, South Africa from 11-13 May 2016 with organisers and delegates at the conference placing more emphasis on the value of open innovation and collaboration among researchers. The conference opened on Wednesday, 11 May, with a high level panel discussion whose participants were drawn from renowned public and private research and education organisations and companies from within and outside the African continent. The interactive discussion, which focused on open Innovation, ICT Entrepreneurship and social innovation in Africa came after inspiring conference opening remarks from representatives from the European Commission, the African Union, SADC and South Africa’s Department of Telecommunications and Postal Services and the Department of Science and Technology. During the discussion, moderated by Paul Cunningham of IIMC, organisers of the conference, panelists unanimously agreed on the need for collaboration among education and research institutions and the need for researchers to embrace entrepreneurship skills in order to market their innovations to the outer world. The panelists shared different practices and experiences from around the world and also dwelled on how National Research and Education Networks (NRENs) can be used to support collaboration in different thematic areas like health. Delegates were also introduced to the European Commission co-funded €26.6 million AfricaConnect2 project which intends to roll out a high speed Research and Education network connecting the continent’s three Regional Research and Education Networks (RRENs) of UbuntuNet Alliance, WACREN and ASREN. The morning panel discussion preceeded parallel sessions that started in the afternoon and run up to the morning of Friday, 13th of May 2016 before another panel on same theme marked the end of the conference in the afternoon. Sandwiched between the two panel discussions were at least 200 presentations from 36 different countries that were presented to delegates that comprised senior policy makers and representatives of leading public and private education and research organisations from at least 39 countries. UbuntuNet Alliance, WACREN, ASREN and GÉANT made their presence felt at conference with a joint AfricaConnect2 workshop titled ‘Value added connectivity for Research and Education networking’ held on Thursday, May 12, 2016 . The workshop attracted over 40 participants that had an opportunity to hear success stories of the AfricaConnect project that rolled out the UbuntuNet network and of symbiotic partnerships that some of UbuntuNet Alliance NREN Members are establishing with private and public entities that are not directly related to NREN business. Related to the AfricaConnect2 workshop was the MAGIC Work Package 5 workshop where delegates were introduced to the recently launched Global Science Communities and a live demonstration of the virtue collaborative platform Collaboratorio.